One in seven American men will get prostate cancer during his lifetime. It’s the second leading cause of cancer death among American men. 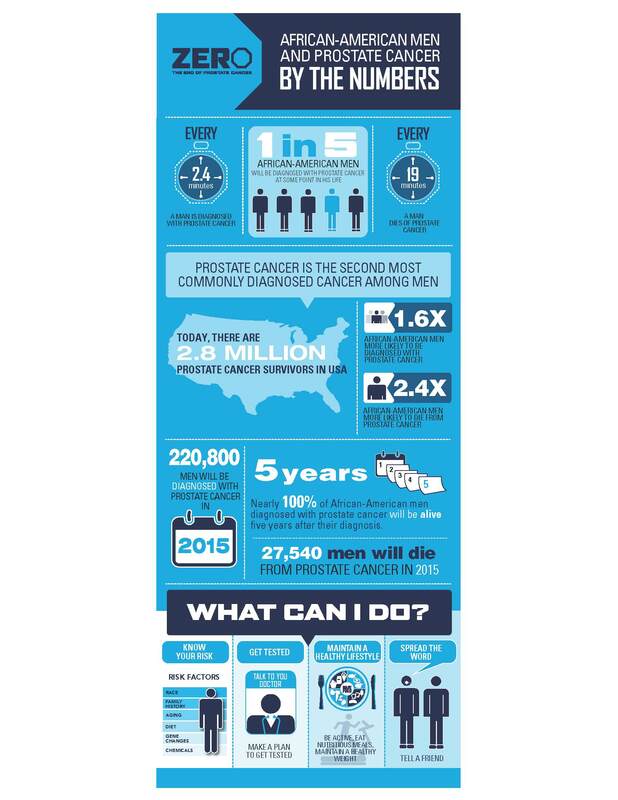 The American Cancer Society estimates that 220,800 men will be told they have prostate cancer in 2015. Unfortunately African American men are considered ‘high risk’ for developing prostate cancer and dying of the disease so it’s recommended that they start being screened at age 40 instead of 50. That’s what Paul did. For several years, Pa ul was getting PSA tests and DRE’s as part of his annual physical. When the tests (which are known to be an inexact science) continued to be elevated, Paul consulted a local urologist and also sought a second opinion with Phoenix-based naturopath Dr. Phranq Tamburi, who used a battery of non-invasive tests to predict the likelihood of prostate cancer. Dr. Tamburi’s tests showed that there was an 85% chance that Paul had prostate cancer, and recommended a biopsy to confirm the finding. Paul reluctantly agreed to a biopsy, but limited the number of samples that were taken to seven and only the suspicious areas (as detected by MRI) of his prostate were biopsied. The results showed that Paul did indeed have prostate cancer. Because the cancer was contained, slow growing and had a Gleason score of six, Paul and his urologist agreed to a period of active surveillance, which included regular doctor visits and PSA tests to monitor his progress. Paul had previously made a number of lifestyle changes including an anti-inflammatory diet, a rigorous exercise regime to which he then added supplementation via UK prostate cancer specialist Ben Ong. After 18 months of active surveillance, Paul’s PSA was continuing to rise and we scheduled a second opinion with Dr. Gary Kirsh, president of The Urology Group (who is both my client and a trusted friend.) I knew that Gary would be objective but also brutally honest, while taking Paul’s desire to postpone treatment as long as possible into consideration. Gary reviewed Paul’s results and expressed concern that his initial biopsy was not thorough and that there was danger that there might be additional undetected cancer in other portions of his prostate. After much discussion (and a little arm twisting) Paul agreed to a second biopsy which showed additional cancer with a Gleason score of seven (3+4), which basically moved him from low to intermediate risk, stage 2B. We reviewed the biopsy results with Dr. Kirsh, Paul’s original urologist and Dr. Tamburi, all of whom agreed that Paul was “bumping up against the edges” of the recommended limits for active surveillance and that he should consider seeking some form of treatment. It was through Ben Ong, that Paul first became aware of transurethral hyperthermia, a procedure pioneered in Germany where a small probe is introduced through the urethra into the prostate. Radio frequencies are then pulsed into the prostate, heating the cancer cells to between 113 and 158 degrees. Proponents of this treatment claim that cancer cells have a different blood supply than normal cells, so they either die or become so damaged from the heat they can no longer reproduce while the normal cells are not affected. Every year, thousands of patients travel from North America to Germany for medical care and alternative cancer treatment. German hospitals and cancer clinics offer the world’s most advanced treatments including Hyperthermia, Insulin Potentiated Chemotherapy (IPT), Dendritic vaccines, Mistletoe therapy, and Galvano cancer treatment at a cost much lower than you can find in the U.S. The rub? The clinics and their treatments are not covered by medical insurance and there are few medical studies on their efficacy. But, as we’ll detail in a future post, we have been in contact with a number of patients who have had excellent results. Paul used a U.S. broker at www.germancancerclinics.com who sent his medical history to a number of the clinics and requested a treatment plan and pricing. There is no fee for patients for this service, as the broker is paid a commission by the clinic. You could also do the legwork yourself as the clinic names are readily available. Paul chose the Klinik Marinus Am Stein because they were the most responsive and efficient. Paul exchanged numerous emails with Dr. Axel Weber who originally recommended three weeks of treatment. Staying in Germany that long wasn’t feasible so Dr. Weber has agreed to compress the treatment into one week. We’ve cashed in our frequent flyer miles and Paul is scheduled to begin treatment on Monday, September 7, 2015. Hey Paul, Sandra and I are praying for a successful treatment and a full recovery. Jill you are a blessing to Paul and your support and friendship is inspirational. Guys have a save, exciting, fun and productive trip. First Time Here? Read This First.